The sales pitch for Captain Sonar is ridiculously compelling. A real time game about battling submarine crews? Sold. Who doesn’t want to play that? Submarine battling is, as a game concept, inversely as awesome as I imagine real life submarine battling to be. 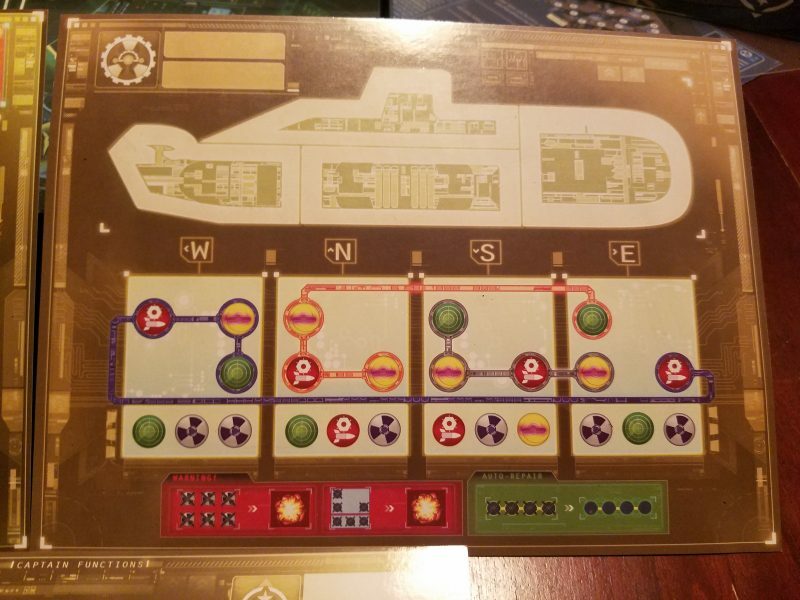 In Captain Sonar you’re going to begin by splitting up into teams of mortal enemies (ideally of 4 or 3 people each). Then you’re going to place the very large screen the game helpfully includes between the teams so they can’t see each other’s ugly faces. Each team is comprised of four roles. The Captain is in charge and essentially decides everything. The Radio Operator has to listen to the opposing captain’s direction commands and tries to deduce where they are on the map. The First Mate keeps charges the various sub-systems (heh) in the vessel and communicates information between the Captain and Engineer. And the Engineer kind of has their own mini-game around keeping the submarine from falling apart in the water. They are a source of constant aggravation for their Captain. Together, each team will work in real time to find the other sub and destroy it. If it seems like the Captain is the only person who really matters here, that’s sort of true, but also not true at all. They’re like a conduit through which information flows. But then they have to also comprehend that information and make smart decisions about it. Mostly they’re going to be shouting out directions (north, south, east, or west) and marking where their submarine is going on the handy dry-erase map. As the submarine moves, just like in real life, it starts to slowly crumble into oblivion and also charge up all of its useful functions. Bad alternator, perhaps? As the Captains bark out orders, the Radio Operator has to listen carefully to the Captain opposite them and mark the movements on their map. Cleverly, the game gives them a clear dry-erase surface on which to mark this so they can move it around over the map and try to figure out where they possibly could be. I’ve found this to be the most difficult of the roles because it’s significantly harder to pay attention to the shouting of one single person (amongst multiple people talking) while literally doing anything else than I could have possibly realized. I’ve found that some people are mysteriously good at this and I do not trust them. The easiest roles are the First Mate and the Engineer, who simply have to mark something on their sheets every time a movement command is issued. The difficult part is that they have to work together to make sure the sub-systems are both charged and not broken. This frequently requires assistance from the captain, who may need to issue a movement command a specific direction so that the Engineer can fill up one of their tubes and repair a string of sub-sub-systems. Don’t worry, that makes a lot more sense when you play it. The First Mate just…charges something one tick and lets the Captain know when it’s charged. This is even less exciting because I’ve found that by the mid-game you’re usually more or less full on all of the systems and it’s up to the Engineer to free them up. In a 6-player game this role gets absorbed by the Captain because there’s not much to it. On one hand the disparity in role complexity here is a bit annoying because I don’t want to put anyone into a lame role. On the other hand it helps the game scale and it allows someone who is uncertain or not good at real-time games to have a simple job. On net I suppose that’s positive. What do the sub’s sub-systems do? The drone allows you to pick one of the nine squares the map is divided into (think tic-tac-toe) and ask the other team if they’re located there, to which they must respond truthfully. Sonar is even more interesting, because when you activate it the opposing captain must give two coordinates on the map (from the X-axis, Y-axis, or segment). One must be true and one must be false. Of all of the decisions in Captain Sonar, this might be the most tricky. Can you come up with a convincing lie that’s possible given the path you’ve taken? Once you’ve done that, can you maintain the possibility of that lie and obscure the path enough before the opposing Radio Operator figures it out? As a Radio Operator, can you both work on testing each of the two coordinates while still keeping a sharp ear on new movement commands? Once you think you have a good bead on where the opponent is, you can start trying to murder them with torpedoes and mines. Mines are dropped off the side of your sub and detonated whenever you want. Torpedoes can target a coordinate within four spaces of your current position. Not only do you need to figure out where the enemy is, you need to cozy up right next to attack. This mechanism works perfectly, because as soon as you hear some rumblings from the other team that they are thinking about dropping a mine or shooting a torpedo, you know that they think, at the very least, that they’re close to you. Then it’s a mad rush to figure out where they are or escape! Escaping often utilizes the silence system, which allows you to move one direction up to four spaces in secret. It’s a nifty tool, but very tricky to utilize well. After getting hit with a mine or torpedo it’s absolutely necessary to bring back some uncertainty to your position, though I’ve found that a halfway decent Radio Operator will be able to re-pinpoint your position within a few moves. Better to utilize silence before the torpedo launches. Let’s pause for a second to consider the name “Captain Sonar”. I’ve been writing and thinking about this game for a while and it just hit me that the name makes absolutely no sense. 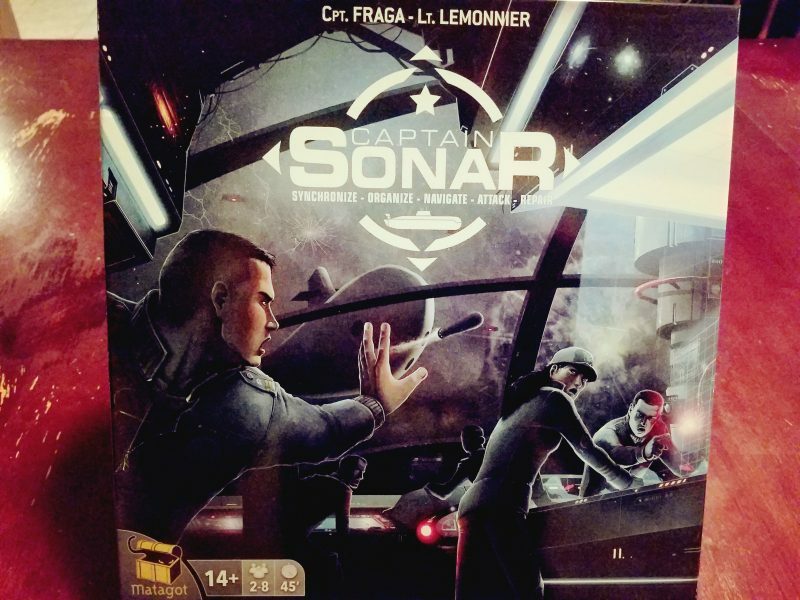 Captains and SONAR are both featured in the game, but what do they have to do with each other such that they are placed next to each other in the title? Is it implying that there is a fictional person named Captain Sonar as part of the game’s rich lore? Is the winning team the Captain OF Sonar? Or is the name simply a list of two nouns, related to the contents in the box but not to each other in such a direct way? What are words, really? There’s even a more confusing acronym. Alright, I’m back. As you may know, we’re huge fans of Space Alert around here. I’m hit and miss on real time games, but Vlaada’s masterpiece adds enough complexity to the genre to force everyone to work together. I’ve seen people complain about the complexity, and while it is a hurdle at first, it’s what makes the game ultimately work as well as it does. 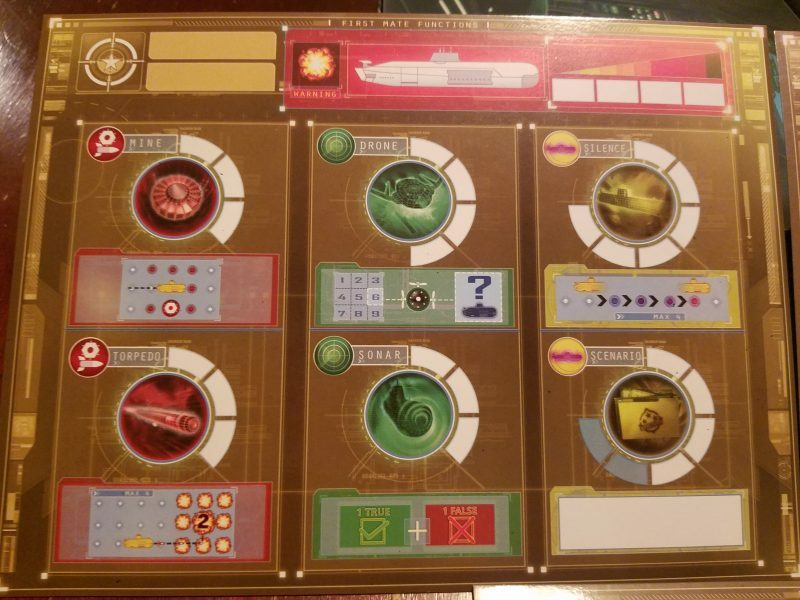 Going into Captain Sonar I was sort of hoping for a competitive version of Space Alert. There are hints here and there of that glorious feeling of frenzied panic, but Captain Sonar is less about keeping up a heightened sense of sustained tension as it is about creating brief moments of excitement. The flow of the game starts with both teams moving about aimlessly to try to charge their systems so they can actually do something. This doesn’t take long, but it’s not exactly full of Hitchcockian tension either. Once a couple of drone and sonar pings go out, the Radio Operators have their fun trying to give useful information to their Captains. Once something is figured out, that’s when the game really begins. One way that can happen is when a sub needs to surface for repairs (or because they moved themselves into a corner–you can’t cross your own previous path), because the forces of entropy and time are going to bring it down, despite the best efforts of the Engineer. When you surface, you have to tell the other team in which segment of the map you’ve done so, and then everyone has to trace out part of an image of a submarine without going outside the lines, like you’re a kid with a coloring book. That visual reference makes the shame of failing over and over on the same dumb bend in the image so much greater as you know that the enemy sub is racing towards your direction. It’s harder than it looks. Don’t judge me! Part of what makes Captain Sonar work is that while you can’t see precisely what the other team is doing, you can hear them. When you notice the Radio Operator and Captain whispering to each other, or if you hear the Captain ask the First Mate and Engineer if torpedoes are ready to go–that’s where the action happens. You need to keep an eye on your own task, yes, but you also need to respond appropriately to the small clues the other team gives you through their actions. It’s meta-sonar in a game about sonar. When action does happen, it comes fast and deadly. Doing damage means also either pinpointing (with a direct hit) or narrowing down significantly (with an indirect hit) where the enemy is. Then it’s a mad rush to finish them off before they can get away. I confess that I haven’t yet mastered the art of escaping. There’s a strange learning curve to Captain Sonar. You need to understand your role and how it fits into the overall framework of the game. At that point you’ll be able to hunt down subs and hopefully kill them. But to get the delicious, moist, multi-dimensional battle narrative that I crave you’ve got to put in the work. You need to trust your teammates and communicate precisely and quickly. You need to understand how all of the systems of the game work together and how to utilize them most effectively. You need to understand how to approach the enemy sub and attack without giving away your own position. And you’ll need to learn how to escape and nurse your wounds, or else whoever gets the first successful shot off is just going to win. I haven’t gotten to that point yet–the point where Captain Sonar stops being a party game and begins being a tense tactical experience. I want to get there, but it’s hard to gather enough people and to have enough people who wish to master the game like I do! But as a party game it’s undeniably a blast. It takes about 10 minutes to get through a round and everyone’s going to have a fun time. The narrative arc of those games will begin a bit dull, have a few moments of truly brilliant excitement, and end somewhat anticlimactically. Sort of like this review.